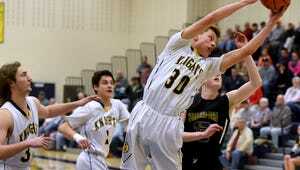 The emergence of Cade Eckhart is one bright spot for the Gettysburg boys' basketball team. The Gettysburg boys' basketball team didn't earn its first victory until the ninth game of the season. That didn't come as a huge surprise. After all, the Warriors lost all five of their starters from a team that made consecutive trips to the state tournament. But the Warriors' first win — a 53-50 decision in overtime against South Western on Dec. 27 — ignited a 7-4 run. And although they dropped their final three games of the season to finish at 7-15, head coach Jeff Bair said he was pleased with the team's progress. "In some areas, we got a lot better throughout the season," the 12th-year coach said. "Our shot selection improved and we got better at taking care of the ball. It allowed us to play the way that we were capable of." In addition to replacing his entire starting lineup, Bair brought back just one rotation player, and a few others who saw minimal playing time before this season. The seventh man a year ago, junior Cade Eckhart took over the reins as the team's starting point guard this season. Eckhart supplied a team-high 12 points per game. He reached double figures 13 times with a high game of 24 points. But the other starters this year — David Buxton, Ethan Ketterman, Tyler Bream and Austin Crushong — were all seniors. Buxton led that quartet at 6.8 points per game. Freshmen Charles Warren (6.3 points per game) and Zach Ketterman (6.0 points per game) each had nice debut seasons, and Warren capped his campaign with a 24-point performance against York Suburban on Friday. Ketterman's top scoring game came in a loss at Bermudian Springs on Dec. 19 when he scored 17 points. Also returning next season will be sophomores Ammon Robinson and Kyle Redding, both of whom saw action in all 22 games this season. "I think our young guys have a lot of potential," Bair said. "We have to physically grow and get stronger and mentally grow in how we play, but the potential is there for us to be a good team." More reason for optimism? Gettysburg's JV squad compiled a 16-3 record this season. And of the Warriors' losses, five of them came down to the last possession. Bair pointed to narrow, home victories against West York and York Suburban as the team's best wins of the year. "Our goal is always to make the district tournament and obviously we failed to do that," Bair said. "We lost too many tight games and I blame myself for that."